This volume introduces students to the rich scholarship and diverse issues of the field. Thirty-five significant essays from the literature explore election dynamics, presidential speeches, media issues, congressional debates, Internet advertising, spectator democracy, and marginalized citizens. Introductions guide student reading on the issues that continue to define citizenship and shape democracy in the twenty-first century. Reviewed in Rhetoric Review 27.3 (2008). "This volume fills a pressing need. . . . It features scholars who utilize multiple methodological perspectives, including an array of social scientific perspectives as well as rhetorical and historical approaches." "I like this book and believe it fills a major void. . . . It is comprehensive in the political communication topics covered; it covers theory and practice issues; it is representative of both classic and contemporary research." "A strength of this anthology is the obvious care that has gone into selecting the materials to be included. These are, without a doubt, some of the very most important publications in the field." "The major strength of the book is the comprehensive approach to political communication." "The broad sweep makes it attractive for general political science and communication classes." "I like the different perspectives that are offered." "Introductions are well written and additional readings are nicely annotated." 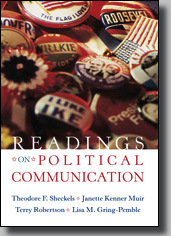 "It provides students with an accessible array of works by political communication scholars. I am certain it will become a valuable resource." "It promises to fill a huge void in what's available for political communication classes." To see the table of contents, please click on this text line. To read the preface, please click on this text line. Theodore F. Sheckels is Professor of English and Communication at Randolph-Macon College. He received his B.S. from Duquesne University and his M.A. and Ph.D. from Penn State University. He is the author of Debating: Applied Rhetorical Theory (1984), When Congress Debates (2000), Maryland Politics and Political Communication, 1950-2005 (2006), and books on South African literature, Australian film, and Canadian women writers. His work has been published in edited collections on Commonwealth literature and film, as well as in Argumentation & Advocacy, Communication Quarterly, Howard Journal of Communications, Rhetoric and Public Affairs, and Southern Journal of Communication. Randolph Macon College has nominated him twice for the Virginia State Council of Higher Education's Professor of the Year Award. Janette Kenner Muir is Associate Professor of Interdisciplinary and Integrative Studies and an affiliate member of the Communication and Women's Studies Departments at George Mason University, where she has also served as Associate Dean of the New Century College. She received her B.A. from Palm Beach Atlantic College, her M.A. from Wake Forest University and her Ph.D. from the University of Massachusetts Amherst. She is a contributing author on Inventing A Voice: The Rhetoric of American First Ladies of the Twentieth Century (2004), Hate Speech (1995), and The Clinton Presidency: Images, Issues and Communication Strategies, (1993). She has also published several instructional handbooks for communication classes and has served as editor of Communication Quarterly. Dr. Muir has received the Distinguished Service Award from the Eastern Communication Association and the Teaching Excellence Award from George Mason University. Terry Robertson is Associate Professor and Chair of the Department of Communication Studies, as well as the Director of the Interdisciplinary Education and Action Program, at the University of South Dakota. He received his B.A. from Drury University, his M.A. from Missouri State University, and his Ph.D. from the University of Oklahoma. His research interests include media coverage of political campaigns, women in the political process, and presidential rhetoric. He is co-author of the book Gender and Candidate Communication (2004) and has published articles in Communication Quarterly, American Behavioral Scientist, The Journal for Critical Education, Policy Studies, Atlantic Journal of Communication, and Speaker & Gavel. Dr. Robertson has received the Outstanding New Teacher Award from the Central States Communication Convention as well as the Belbas Larson Teaching Award and Cutler Research Award from the University of South Dakota. Lisa M. Gring-Pemble is Associate Professor of Interdisciplinary and Integrative Studies, as well as an affiliate member of the Cultural Studies and Women's Studies Departments at George Mason University. She received her B.A. from St. Olaf College and her M.A. and Ph.D. from the University of Maryland. She is the author of Grim Fairy Tales: The Rhetorical Construction of American Welfare Policy (2003). Her work has appeared in The Quarterly Journal of Speech, Political Communication, and Communication Quarterly. She has taught in several communication and interdisciplinary learning communities and has written articles in Inventio and Connecting the Classroom to the World: Integrative Studies. Dr. Gring-Pemble has received the Teaching Excellence Award from George Mason University.